Astronaut Mike Lounge's official NASA portrait. This story was updated at 10:49 a.m. ET. 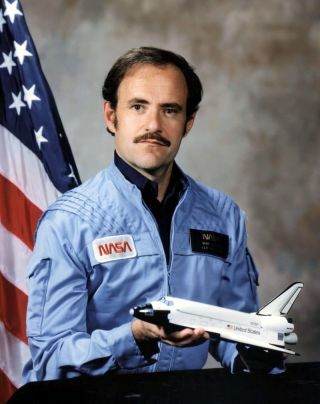 John "Mike" Lounge, a former astronaut who flew on three space shuttle missions including the return to flight following the 1986 Challenger tragedy, died Tuesday of complications from liver cancer, according to sources close to his family. He was 64. Chosen for NASA's astronaut corps in 1980, Lounge made his first space flight five years later aboard space shuttle Discovery's sixth mission. Together with his four STS-51I crew mates, Lounge helped deploy three communications satellites and operated the robotic arm during a spacewalk that repaired and re-deployed a fourth. His next mission assignment, a May 1986 shuttle flight to launch the Ulysses probe to study the Sun, was canceled in the wake of space shuttle Challenger being lost in flight. The STS-61F mission as then planned would have carried the first Centaur cryogenically-fueled upper stage onboard the space shuttle. Instead, Lounge and two of his STS-61F crewmates were reassigned to fly the first mission following the Challenger accident, Discovery's STS-26 "return to flight." Launched on September 29, 1988, STS-26 flew on redesigned solid rocket boosters and the crew, including Lounge, wore new pressure suits for ascent and re-entry. The flight's primary payload, a tracking and data relay satellite, was deployed successfully. Lounge made his third and final flight to space aboard the shuttle Columbia on the first mission dedicated entirely to astronomy. The STS-35 payload, ASTRO-1, included four telescopes mounted in the shuttle's bay. The mission set a record even before departing: between technical issues and weather holds, STS-35 was the most delayed launch of the space shuttle program, finally lifting off after seven months on Dec. 2, 1990. Over the course of three missions, Lounge logged a total of 20 days, two hours and 23 minutes on-orbit. When he wasn't flying in space, Lounge was a member of the launch support team at Kennedy Space Center for the first three shuttle missions and later participated in space station design development. From 1989 through 1991, Lounge managed NASA's space station support office, representing astronauts interests in station design and operation planning. He departed NASA in June 1991 to join SPACEHAB (now Astrotech Corp.), which provided pressurized modules for space shuttle missions. He offered his reasons for leaving in a statement released at the time. "This is a very tough job to leave," Lounge said, "but I feel that three flights is my fair share, and I'm ready for a new challenge." "I remain completely dedicated to our long-term mission of the exploration and exploitation of space. We are building the pyramids of our civilization, and it takes a huge team to get that done," he continued. "I'm not leaving the team, I'm just changing positions." Lounge changed positions again in 2002, directing space shuttle and station program development for Boeing. Two years later he became the aerospace company's director for business development for integrated defense systems and space exploration. John Michael Lounge was born June 28, 1946, in Denver but considered Burlington, Colo., his hometown. A graduate of the U.S. Naval Academy in 1969, he earned his Master of Science degree in astrogeophysics from the University of Colorado in 1970. On active duty with the Navy following his graduation from the Academy, Lounge spent nine years serving a variety of assignments. Lounge completed flight officer training in Pensacola, Fla., and then went on to advanced training as a radar intercept officer in the F-4J Phantom interceptor. He then reported to Fighter Squadron 142 (VF-142) based at the Naval Air Station Miramar in Calif. While with VF-142, he completed a nine-month southeast Asia cruise aboard the USS Enterprise, participating in 99 combat missions, and a seven-month cruise onboard the USS America in the Mediterranean. In 1974, he returned to the Naval Academy as a physics instructor. Two years later, Lounge transferred to the Navy Space Project Office in Washington, D.C. He resigned his regular United States Navy commission in 1978 to become a NASA engineer at the Johnson Space Center in Houston, working on shuttle satellite integration. He also served as a member of the Skylab space station reentry flight control team. The recipient of three Navy Commendation (with Combat "V") and six Navy Air medals, Lounge was also awarded three NASA Exceptional Service and three NASA Space Flight medals. He also earned the Superior Achievement award from Johnson Space Center for his work on Skylab. Mike Lounge Drive, part of 18th Street in his hometown of Burlington, was renamed in his honor. He is survived by three children from a former marriage, Shannon, Kenneth, and Kathy.